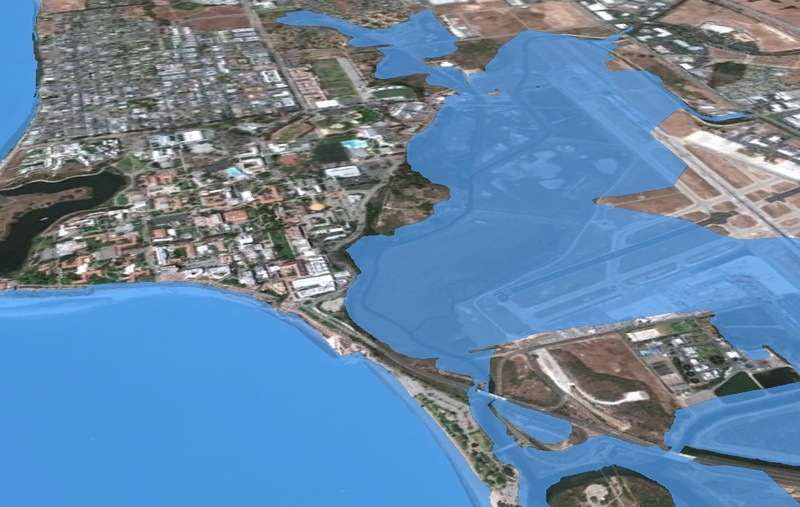 At 3 meters, the airport is under water. 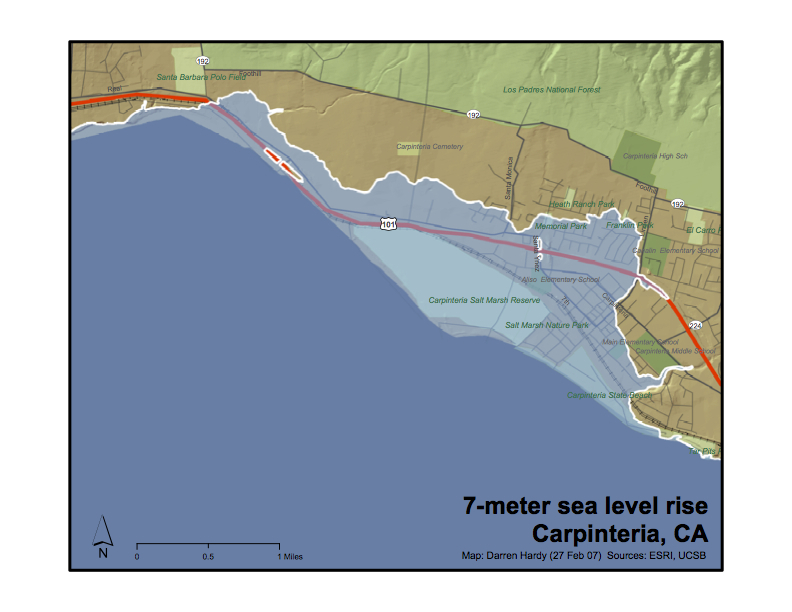 Here are the 1 meter, 3 meter, 5 meter, and 7 meter sea-level rise data display layers (KMZ) for Santa Barbara and Goleta. To use: open these in Google Earth. Created by Darren Hardy and Frew. This map was made by Darren Hardy (UCSB) with a DEM and ESRI software. 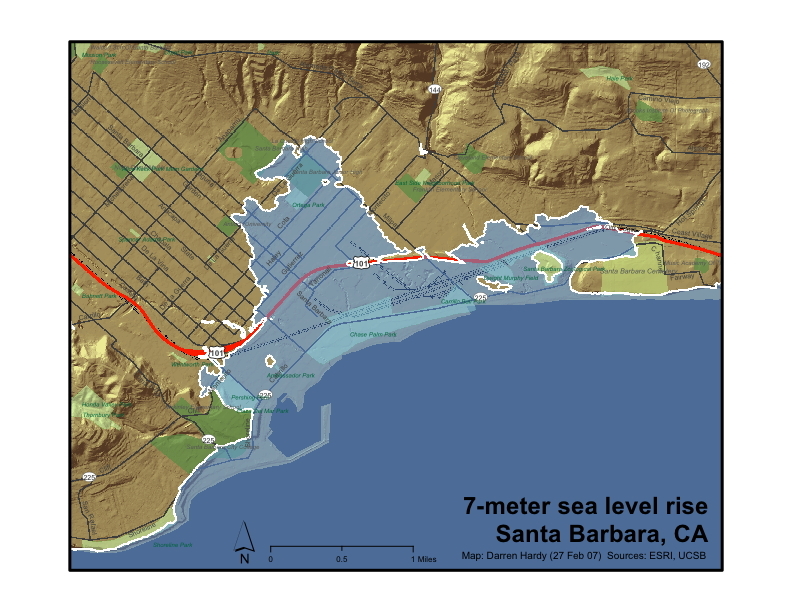 This map was created by Darren Hardy (UCSB) from a DEM and ESRI software. September 27, 2011. Tony Carnie at The Mercury reports on the Blue Line being drawn across the city of Durban, South Africa to mark the threat of future climate change. “A “Blue LINE” will be painted along several sections of the Durban beachfront within the next few weeks to show just how high the sea could rise if nothing is done to halt climate change. KwaZulu-Natal Premier Zweli Mkhize said the idea behind the project was to raise awareness about some of the “devastating impacts” of climate change in the build-up to the UN climate change summit (COP17) to be held in Durban from November 28 to December 9. Opening the provincial summit on climate change in Durban yesterday, he said his office was planning a march through the city during the summit. It was hoped ministers, business leaders and other groups would participate in the march, which would follow part of the “blue line” representing a possible future sea level rise in Durban. 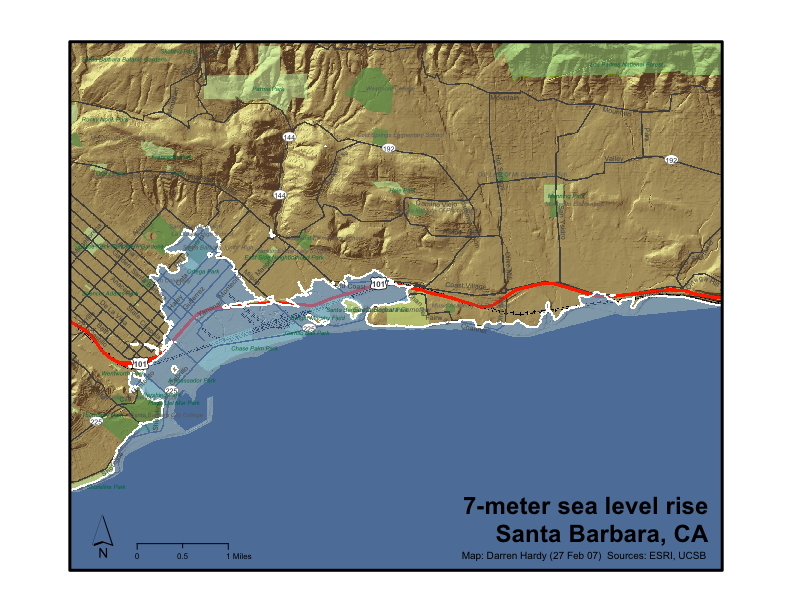 Details have not been announced yet, but it is understood that the line could be based on a 1m rise in sea level. Based on recent research and computer modelling by the eThekwini municipality, a 1m rise is likely to undermine or destroy large areas of Durban’s Golden Mile, including several hotels and other tourist infrastructure. 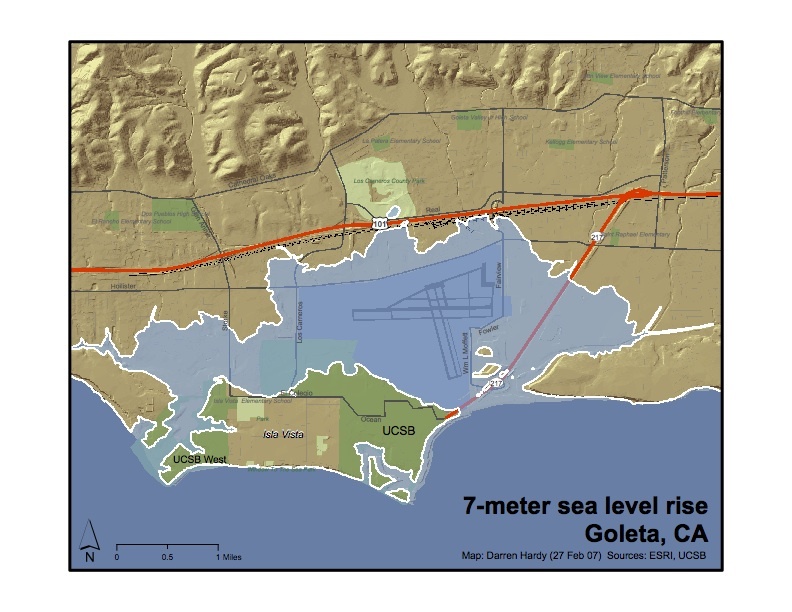 The city has modelled a number of scenarios based on projections of 300mm, 600mm and 1m sea-level rises. Four years ago, the UN’s expert scientific body on climate change projected that the sea level around the world could rise from anywhere between 180mm and 580mm by the end of this century as result of rising ocean temperatures and the melting of glaciers, snow and ice in polar regions. However, recent work by German climate change researcher Stefan Rahmstorf and other scientists has suggested a sea-level rise of 1m was possible before 2100.